Are oceans becoming more acidic and is this a threat to marine life? How does it work? Ocean acidification has become a major scare in the scientific literature and the media. This chapter shows what is known about carbon dioxide in the oceans in order to understand how ocean acidification works and what effects it could cause. Also new insight is cast on CO2 processes in a living Earth. what is the carbon situation? Where is all carbon stored and how much of it is circulating? reservoir or pipe? do we need to treat the CO2 in air as a reservoir or as a pipe connecting all living things? is the level of carbon dioxide rising? What evidence exists that CO2 in air is rising? where is the CO2 in the oceans? the oceans and the sea soil form a massive store of CO2. is carbondioxide absorbed by the sea? CO2 takes part in the normal exchange but is it being sequestered? how acidic are the oceans? what is the normal acidity of the oceans and by how much does it vary? are oceans becoming more acidic? what evidence exists that the oceans are becoming more acidic? the Bjerrum plot of the carbonate system: much value is attached to classical carbonate theory but does it stick? so why is acidification a problem? the main fear is that increased acidity would erode shells and coral reefs. is CO2 a potent fertiliser? Land plants are seriously limited by a dearth of CO2, but what is the situation in the sea? is phytoplankton in decline?There have been alarming claims but the evidence is not scary. are coral reefs threatened? All alarmist publications agree that corals will soon be extinct due to coral bleaching and dissolution of coral skeletons, but what does factual science say? natural CO2 vents A recent study found that biodiversity decreased near natural CO2 vents. What does it mean? phytoplankton calcification A recent study finds that CO2 improves calcification in coccolithophores, as we predicted. crustose coralline agae affected by raised levels of CO2? A much-hailed study with severe deficiencies. declining coral calcification: Porites corals show a sudden and unknown reduction in calcification towards their skins, but the study is a fraud. Guinotte & Fabry: an overview article about ocean acidification, frequently cited by others, almost entirely fictional. further studies: a mix of further studies debunking the fear of ocean acidification. Summaries only. go to part 1, introduction and conclusion <==> go to part3, uncertainties and missing knowledge. You are now ready to learn about global climate and the global warming fraud (large chapter). NOTE this page is best viewed in a window of normal page size. 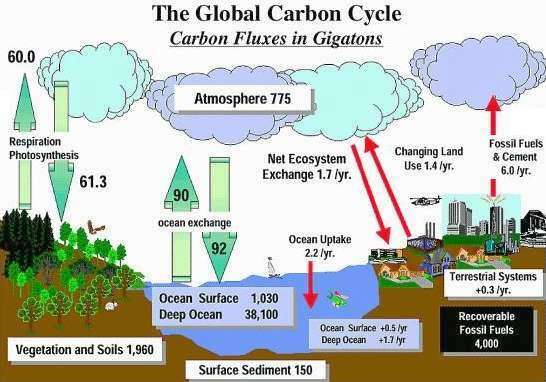 What is the carbon situation? Over the past two decades scientists gained a fair understanding of where all carbon is found and how much of it circulates between atmosphere, land and sea, although significant differences can be found among authors. As one can see, the human contribution is about 8Pg carbon per year (8Gt, billions of tons) against a global respiration rate of about 100-250Pg/y (fossil fuel alone: 2%, some say 3%). It is thought that this contribution is the cause of the observed increase in the concentration of CO2 in the atmosphere from a supposed 180ppm pre-industrial to a present-day 400ppm. So there is good certainty that the amount of CO2 in the air is rising. The critical question remains why? Many scientists believe it is caused by the burning of fossil fuels and other human activities, but considering the presence of a huge reservoir of carbondioxide in the ocean, one should ask whether the tail is wagging the dog (see box below). This diagram shows the latest figures (after Holmen, 2000) with residence times and today's atmospheric carbon at 700Gt. The land has been split in two compartments and the oceans in three. Apparently plants assimilate 122Gt/y in photosynthesis, with leaves dying after 5 years, and their stems and decaying wood estimated at 1100Gt, decaying in 20 years while returning 60Gt back to the air. Of the total, only 2Gt is sequestered. From this less than 0.1Gt is sequestered for 1000y in fossil fuels and shales. 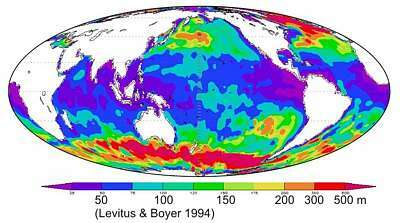 The oceans have been split into three compartments, with mainly the surface ocean interacting with the atmosphere, photosynthesising and respiring/decaying 100GtC/y while sequestering 2 GtC/y. Only 0.3 GtC/y rains down in the form of carbonate oozes of marine sediments of which a massive 30 million GtC exists, to be circulated to the surface through ocean floor spreading, subduction and volcanic activity, which takes 100 million years. of the plants, their soils have been neglected, including the fast turnover of CO2 between them. Batjes (1996) estimates soil carbon at 2200GtC ("the soil is the largest terrestrial pool of organic carbon"), a substantial addition to above diagram. fossil oil and shales come from the sea, not the land but peat and coal do. the figures differ too much from previously published ones. values for sequestration are guessed at, being the small difference between two large figures. residence times for deep ocean water have been measured to be less than thousand years, not 100,000.
carbon exchange with sea soil is not shown. forest burning and habitat change are not shown. deep carbon clathrate deposits are not taken account of. Compare this diagram of global carbon dioxide fluxes and reservoirs with the previous one and notice the large differences. What all this means is that we know very little for sure about the most important process on Earth. Present-day thinking goes as follows: human-made CO2 is extra to the normal carbon cycle. It therefore accumulates in the atmosphere, which also makes the sea more acidic. But the ocean is vast and CO2 has an uncanny affinity with water. Thus oceans stabilise the CO2 fluctuations from the seasons and the differences between ocean and land. The oceans contain far more CO2 than air: 38,000Gt versus 700 Gt (about 50 times). A slight warming of the ocean expels CO2 while becoming more acidic, about 1000-1500Gt per degree C (see graph in part 1) . Thus ocean warming => releases CO2 to water => releases CO2 to air => higher CO2 levels in air. Only very little warming is required to match today's increase in CO2 in air. Which scenarios are most likely? Indeed Faure estimated from his studies of past land cover that during the transition from the last ice age to the present inter-glacial, some 4000Gt CO2 (1200GtC) was transferred from the ocean to the continental biosphere (through the carbon pipe, see further). Compare this with 700GtC in the atmosphere and 1170GtC in the biosphere as mentioned above. Note that Faure's estimate of terrestrial biomass today is 2300GtC. The relationship between ocean temperature and CO2 in the atmosphere is shown here, as graphed by Prof Lance Endersbee (www.atse.org.au), showing a near-linear relationship with little deviation from it (R2=0.996, a measure of match). As temperature rises, so does the concentration of CO2 in the atmosphere. Note that this graph does not prove who drives whom, but as atmospheric temperature stabilised and even declined in the years 1998-2008, while oceans continued to warm, it becomes defensible that rising ocean temperature is the driving force behind rising concentrations of CO2, as explained above. However, critics argue that the 21-year averaging of temperature will always give a straight line of sorts, but to simulate deep warming from surface variations, by long-term averaging is entirely proper. the effect of the carbon pump through the deep sea is unknown as cold seas absorb CO2 while warm seas expel it. For instance, assuming a rate of 3%/ºC degassing at global average temperature (see part1), and an amount of 38,000Gt (C) dissolved CO2, the amount outgassed for the whole ocean would be 1,140Gt/ºC (Carbon) or 635ppmv/ºC for the whole ocean. The surface 100m with 600Gt C is perturbed a few times per year, contributing almost instantly to warming, or 18 Gt/ºC (carbon), or 10ppmv/ºC. Remember 10ppm/ºC for each 100m of ocean depth. Endersbee's figure of ~300 lies comfortably between 18 and 1140. Reader, as you may notice, there is a lot of uncertainty here. The 'Keeling curve' from Mauna Loa may eventually dip again. One thing is certain: as long as the oceans warm up, it outgasses CO2. Thus the oceans, while warming, do not absorb the extra CO2 from fossil fuel, but they do recycle it. One cannot have it both ways. See also Fred Goldberg www.heartland.org/custom/semod_policybot/pdf/25543.pdf who comes to the same conclusion, following a different logic. Update Aug 2011: Endersbee's curve is heavily contested mainly because he took a period in which both temperature and CO2 were rising. However when earlier data is included to 1960, the linearity distorts. More important, the new measurements of missing oxygen climate4#missing_oxygen lead to the conclusion that seas have been absorbing CO2 for several decades, rather than exhaling it. Thus temperature follows its own course, stabilised by the ocean and independent of CO2. Update Aug 2011: The missing oxygen experiment gives compelling evidence for option 2. Where are the carbon sinks? As the block diagram above suggests, both the sea and the land sequester 2 of the 6-8 GtC/y anthropogenic (human made) CO2 or about 50%, but where does it go? At the bottom of the diagram, a total of 0.4 GtC/y is sequestered 'permanently' in sediments. Can the terrestrial biosphere keep storing 2% additional carbon per year? Eventually trees die and their wood is decomposed back into CO2, otherwise the amount of standing vegetation would double in 60 years (not altogether impossible). In this respect the sea is in a better position, as it already contains some 40,000 Gt, as in 60 years time it would have increased by only 0.3% GtC. Thus the sea will most likely be the ultimate carbon sink, and for this reason also the ultimate source of carbon when the temperature increases. "Eighty percent of inputs from land to sea are deposited here [in coastal margins], and 85% of organic carbon and 45% of inorganic carbon are buried in the ocean margin sediments (Gattuso et al., 1998a; Wollast, 1998; Chen et al., 2003)". This suggests that carbon from the terrestrial biosphere finds its way to the sea, carried by rain water and rivers, not shown in the diagram. "Carbonate accumulation in coral reef environments alone accounts for an estimated 20–30% of the global ocean accumulation (Milliman and Droxler, 1996)". "Ocean margins are also heavily impacted by human activities, as nearly 40% of the global population lives within 100 km of the coastline (Cohen et al., 1997). Since the onset of the Industrial Revolution, burning of fossil fuels and land-use changes have caused substantial increases in both atmospheric CO2 concentration and in the delivery of organic matter and nutrients to ocean margins (Mackenzie, 2003). Such changes could alter the role of this system and considerably affect important processes such as air-sea CO2 exchange". As the sea warms, the warmer water remains on top because it is lighter, which results in a layer of warm water above a thermocline, below which the colder water is found. Thus the water above the thermocline, also called the mixed layer, is more in contact with the atmosphere than the water below it, which cannot reach the surface. This map shows the depth of the mixed layer, with the warm tropics being very shallow and the cold subantarctic very deep. Notice the rather strange false colour scale below it. It so happens that warm water breathes CO2 out whereas cold water breathes it in. Notice also that the mixed layer depth changes with the seasons. The next question is: how does temperature affect the in- and ex-haling of CO2? Much effort has been spent travelling the world's ocean to measure the net flux (flow) of CO2 in and out of the ocean, and the map here shows its result. Where the water warms and wells up from the deep, the release of CO2 is dominant. Conversely where the water cools and sinks, CO2 dissolves into the water. The figures are in trillions of grams or billions of kg or millions of tons carbon (MtC) per 4x5 degree area. Note that these 'squares' become significantly smaller towards the poles, and also that the pattern changes with the seasons. Most importantly, from the complex dataset it cannot be determined whether the oceans are over-all breathing in or breathing out, let alone by how much. A quick impression is that there is more blue and purple (CO2 in) than yellow and red (CO2 out). Note that scientists cannot actually measure the flow of CO2. They measure the partial pressure of CO2 (pCO2aq) in the water and above it where pCO2 is equal to ppmv CO2, and then computers do the rest. Whether this is true to nature, is not known, also because wind plays a role. Reader did you notice the high level of uncertainty here? Atmospheric scientists treat the atmosphere as a reservoir, with inputs and outputs, much the way bean-counters treat a company balance sheet. But is it a correct model? Nearly all of the CO2 added by deforestation and the burning of fossil fuels has mysteriously disappeared, absorbed by plants and plankton. As both humans and the sea add more CO2 to the air, it keeps disappearing at an ever faster rate. But plants cannot sequester CO2 at a faster rate if its concentration in air remains the same. Note that all plants and plankton are competing for the one and only resource of CO2 in air, and species who do it better than others, come out winning. However, faster absorption can happen only if also the concentration in air increases. In other words, the atmosphere acts more like a pipe than a reservoir. This pipe can transport more gas only if its pressure (concentration) increases. The pipe concept may explain why a transport of 1,000-1,500Gt (carbon) from sea to land can be achieved with an increased CO2 concentration of only 150Gt (carbon) in a pipe of 700Gt. But how does this work? The graph shows how ecologists see the growth of populations. The green curve shows growth in biomass over time, from a near-zero beginning in a world without limitations. The rate of growth here depends only on how much offspring survives, and follows an exponential (explosive) curve. However, gradually some important resource becomes inadequate to sustain this growth, and the population grows ever more slowly until it reaches a maximum for which the resource (right hand scale) is zero. Of course this cannot happen in real life because populations regulate their sizes by their longevity, fecundity, disease and predation. Besides it costs more and more energy to find the last left-overs of the resource, scattered here and there (this is NOT the case for CO2). The right-hand side plots (red) growth rate against resource use, showing high growth rate at 100% and rapid decrease towards 0% (top). Note, however, that each population and each species and each individual within a species has its own growth curve. Note also that this graph has more value as a thought experiment than reflecting the real-world situation. For populations of warm-blooded animals it is impossible to live near exhaustion of their resources because they need so much energy even while sleeping. But cold-blooded animals (insects, worms) do much better. Best of all do the plants because they don't even move, building their biomass up gradually while living long lives. They live from a different source of food, from the energy of the sun which comes to them only at the cost of dehydration. So they are able to live even in low levels of their most important resource, CO2. Note that CO2 in air is rare. Whereas one in five molecules is oxygen, only one in 3000 is CO2. It is a miracle that plants do so well in such a depleted resource. But CO2 was once six times richer in the age of the dinosaurs (2000ppmv), while the climate was also warmer. Now that the concentration of CO2 is increasing again, we see plants doing well, expected to grow exponentially (ever faster) in reaction to CO2 (see diagram). This could explain why we observe a linear increase of CO2 associated with an exponential sequestrationtion of exponential anthropogenic (man-made) CO2 from an exponential growth of plants. Ironically the modern plants (herbs, weeds, leafy trees, grasses) react with less vigour (20-40% for a doubling of CO2) than the ancient types (ferns, cycads, pine trees) (80-100% for a doubling in CO2) because they have better photosynthesis evolved in a low carbondioxide world and are therefore not starved as much. Note that growth is possible only if a plant's other resources are adequate: warmth + water + nutrients, which explains why natural carbon sequestration happens only in certain regions of the planet. Note that CO2 is perhaps the only scarce resource that is not scattered around, but is instead spread very evenly through the atmosphere. If our discovery of a direct path for CO2 from symbiotic decomposition to the plant's roots is valid, then 50% or more of a plant's CO2 needs could come direct from the soil, and this has been overlooked by agriculturalists and scientists. Experiments with higher CO2 concentrations in air have also excluded this source of raised CO2 in soil. Perhaps a time delay is in place for the path: CO2 in air => more plant growth => more leaf drop => more decomposition => more CO2 uptake from the soil. For this reason, natural ecosystems may sequester CO2 better than experiments suggest. We discovered that decomposition cannot complete for lack of energy. Plants therefore secrete energy (sugars/polysaccharides) from their roots to promote complete and fast decomposition (symbiotic decomposition). For a small expenditure in sugars, they receive the nutrients they crave for, and also all CO2 that goes with it. Scientists have indeed observed that plant roots excrete sugars, and so do marine algae and plankton, as well as coral reefs. However, they have not (yet) discovered why. See our DDA chapter. The way molecules move in air is radically different from how they move in water. In a liquid, the molecules are packed closely together, with enough freedom to slide past one another, whereas in air (which is 800 times less dense), they move freely with a large amount of vacuum in between. In this vacuum the gas molecules attain high velocities, allowing them to mix rapidly. Ironically, each type of molecule (O2, N2, CO2) behaves as if the others don't exist, their individual partial pressures being in balance with those in water, earth, leaves and so on. One would be tempted to treat the atmosphere as a reservoir for each constituent gas, and this is indeed how scientists treat it. The idea of a pipe is therefore new, requiring some explanation. The amount of CO2 in air is very small (0.03%), much like that of a pipe compared to a reservoir (100%). An increase in (partial) pressure results in an increase of plant growth which results in an increase in gas exchange (flow). In a dead world, CO2 concentrations would be in perfect equilibrium between air, sea and land. However, a living world pumps it around, absorbing it into plant life and exhaling it again from animal life and decomposition while also reacting to global temperature, sunshine and CO2 concentration changes. Depending on changes in temperature, sea and land act as reservoirs (1800Gt and 38,000Gt) connected by a narrow pipe (700Gt) with a high throughput (200Gt/y). When the earth and the sea warm up, CO2 is released and absorbed by land life. When the earth cools, the reverse takes place. High volume pipes exist but are ignored by atmospheric scientists because they do not connect through air, even though they store much carbon (see diagram below). some measurements rely on radioactive carbon (made from nitrogen by high energy radiation). However, the air is polluted by man-made CO2 which has no radioactive carbon (because it sat underground and lost it over time), and by nuclear tests which cause high concentrations of it. To make matters worse, the production of radioactive carbon is not constant. Nuclear 14-C indeed had a residence time of about 5 years. one method relies on the dilution of radioactive carbon by man-made carbon, assuming that we know the precise origin, quantity and decay of each and the role the oceans play in this. all methods assume that CO2 is evenly spread through the atmosphere and that it cycles equally fast in all atmospheric layers, which is unlikely. alll methods assume a single 'average' cycle, however nature is bound to have both very fast and very slow cycles (see diagram below). all methods assume a dead planet where life does not react to concentrations in CO2 or temperature, and does not influence the flow rate. the methods used cannot detect fast cycles, as these return the same carbon that was absorbed a short time before. some CO2 dissolves rapidly in rain and is washed out of the air in a matter of days. The diagram shows how an imaginary carbon pipe connects all living creatures and also to some extent with the inanimate sea water into which CO2 dissolves so easily. As can be seen, the highest flow is found outside the atmosphere, inside the soil on land and the photic (sun-lit) zone in the sea. CO2 escaping direct from the soil is also likely to be trapped first by the overlying canopy, resulting in a residence time of hours rather than years. Although leaf litter and animal wastes take months to recycle, the residence time here is still a fraction of a year. The sea circulates faster still: because plankton cells are so small, growth rates in the sea are extraordinarily high. For instance, the rise and fall of a plankton bloom can happen within a week, and dead plankton fully recycled within a month (most of which is returned within a week), resulting in a residence time of less than one month rather than 5 years. But recycling with the deep sea bottom takes hundreds of years. Likewise, the CO2 found in the upper atmosphere is not likely to play a role, resulting in long residence times. It is therefore wrong to think of an 'average' residence time in air. To accentuate the confusion, scientists think that the residual CO2 in air, amounting to 2Gt/y of the 6Gt/y that humans emit, can decay only at the rate that it was accrued, which could take a century once the 600ppm is reached (a doubling of CO2). When oceans expel CO2 as they warm up, the new CO2 charges the carbon pipe, resulting in faster turnover in coastal seas and on land where vegetation is not severely limited by other factors. The human CO2 also charges the carbon pipe. Scientists at the University of Bristol found that over a long time period from 1850 to present, the ratio between CO2 in air and the amount sequestered by land and sea vegetation has remained remarkably constant to within 1%, despite a significant rise in human-produced CO2. In other words, as the concentration in air rises, so does the rate of recycling. This study essentially supports what we have explained above. Knorr, Wolfgang (2009): Is the airborne fraction of anthropogenic CO2 emissions increasing? Geophysical Research Letters, VOL. 36, L21710, doi:10.1029/2009GL040613, 2009. Reader please note that some of this we discovered here at Seafriends in 2005, as explained in the DDA chapter. The planktonic decomposers and the way symbiotic decomposition transfers CO2 direct to the plant as a significant source of carbon dioxide, is a discovery that has not (yet) been confirmed by mainstream science. Is the level of carbon dioxide in air rising? The diagram shows the growth in population and our use of resources. The vertical scale is logarithmic, which shows exponential growth best. In the top left one sees three lines for a 5,10 and 100 times growth rate per century. It brings the shocking reality that population (p) still grows at the rate of 10x per century, all energy use (e) at close to 100x per century. Ironically, the top brown curve for CO2 (h) does not keep up with these trends, and by comparison, appears to be levelling off. In other words, the relationship between increased CO2 levels in air, and the growing use of energy, is rather weak. Then again, a doubling in 30 years would imply an underlying growth rate of close to ten times per century, still far removed from the actual rate of increase in fossil fuel burning. Reader, note that in climate chapter 4, a strong relation between CO2 in air and human emisions is defended. Note also that the world is still doing relatively well, as measured by GDP per person (gp), and even the use of water per person is still climbing, but not for long (wp). An interesting fact is that the total energy (e) until 1800 consisted of burning biomass (sustainable). In 1800 the use of coal took off, later flattening off (b) because by 1870 oil replaced it and later still, gas. There is a lot of panic about CO2 levels rising to 400ppm and above, but in the history of the planet, CO2 has often been much higher, and the present low levels of CO2 could be considered an anomaly. At the time of the great dinosaurs, carbon dioxide levels were five times higher still (2000ppm) and life as we know, was prolific back then. Evolution towards diversity also thrived.It is further important to note how much volcanism contributed to CO2 and that current low concentrations are an anomaly.The world did very well back then. No reason to panic! The work of Budyko has been replicated and refined, and essentially been confirmed, see diagram and further below. To understand ancient epochs, read our Geologic Timetable. The general consensus is that the concentration of CO2 in the atmosphere is increasing. Very accurate measurements at mount Mauna Loa in Hawaii and independently at Baring Head in New Zealand, show a steadily growing CO2 concentration (red line) [see note2 below]. But the data before 1960 remains sketchy. The IPCC attaches high value to CO2 measurements from air bubbles trapped in ice which indicated that the pre-industrial concentration was about 270ppm. Knowing the age of each point by the year rings in the ice, the brown curve resulted from the Siple Dome in West Antarctica (drilling 1996-2005, 990m deep). However, this curve did not join up with that of Mauna Loa, so it was arbitrarily shifted right by 83 years, and also down a little. The reason for doing so is that the first part of the core, containing compressed snow or firn, is still 'open' to atmospheric influences, see dotted brown curve with question marks, and the box below. The ice core data is not a year by year measurement for each depth. It is measurements of a range of layers, which are not linearly connected. They then construct a CO2 average for each year. This means that each year of data points is not a measurement; it’s a calculation of disjointed averages. Hence any year over year specific changes in CO2 will be lost. Note also that the Keeling curve for Mauna Loa is based on minimum CO2 values, and that ice cores enclose average CO2 values. Some scientists [Jaworowsky, Segalstad] mention that the method is flawed, since CO2 does dissolve into ice and it even escapes. For instance, the starting pressure at the top of the curve is already 5 bar and increases to 15 bar at the bottom. Already since about 1750, chemistry scientists have done CO2 measurements in a more classical way, and the tens of thousands of data points join up quite well (green curve), even though many measurements were taken in industrial cities. 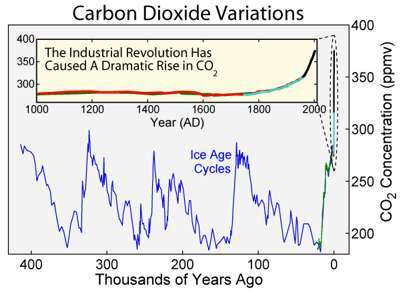 The green curve shows that perhaps the CO2 concentration was not all that ideal both inside the industrial age and before. Note how it eventually joined up with Mauna Loa. Is the 83 year shift scientifically acceptable? In the Siple Dome ice core the age of each point in the core was accurately known from the core's 'year rings'. At the top of the core, snow is gradually being compressed until it becomes ice. During all that time, the air in the core is thought to stay in contact with the air above, which causes CO2 to escape. But why would CO2 escape from a lower concentration to a higher one? If there still exists an air path to the open air, should CO2 not escape from the air to a lower concentration, thereby lifting the resulting curve upward? Clearly there remain too many unanswered questions about whether the measured CO2 in trapped air bubbles indeed represents the CO2 concentrations of the past. Most worrying is that the dotted brown curve is not published. In fact, the raw data is not available. High pressure of the ice does not influence the makeup of entrapped gases and does not dissolve CO2 into ice in the form of clathrates. The age of gases in the air bubbles is much younger than the age of the ice in which they are entrapped, ranging from decades to millennia. Prof Jaworowsky found that indeed CO2 gas dissolves readily in ice under pressure, forming clathrates; drilling contaminates cores with drilling fluid while forming cracks; as ice cores relax, dissolved CO2 gas from clathrates expands and forms new bubbles; gas escapes from ice cores (likewise for nitrogen and oxygen at different 'dissociation' pressures); average pre-industrial CO2 concentration was around 330ppmv, not 260. [1,6]  Another fact is that CO2 is 70 times more soluble in water/ice than nitrogen and 30x more than oxygen. Stauffer, B & Berner, W: Symposium on the Physics and Chemistry of Ice; Proceedings of the Third International Symposium, Cambridge (England) September 12-16, 1977. Journal of Glaciology, Vol. 21, No. 85, p 291-300, 1978. One cannot deduce a past static state using a dynamic conditions method. Measurements of gases, temperature and volcanic activity are done by measuring proxies, such as the amount of dust in a core for volcanic activity, and the ratios of radioactive elements for temperature and carbon dioxide. In all cases, a consistent record is obtained for the distant past, but this never seems to join up with the situation of today and the past two centuries. An inconvenient discontinuity remains. So we can't be sure whether the proxies are right. The fact that the past does not join up with the present, is in fact proof that there is something wrong. If only the top of the ice core or sediment core would agree with today, the methods would gain more credibility. So far, they don't. The graph shown here illustrates the point: scientists (of the IPCC) have abutted three different proxies to the reliable measurements of Mauna Loa, without expressing doubt about the scientific validity of it. For instance, has anyone tried to grow plants and seedlings at 180ppm? It suggests that life on Earth during the ice ages was much less than half of what we have today and very much less productive too. The CO2 measurements at Mauna Loa (Hawaii) and Baring Head (New Zealand) both measure CO2 concentrations over the Pacific Ocean, the world's largest ocean. As such they are representative only of CO2 above the ocean at their respective latitudes, and will almost certainly not represent CO2 concentrations found above land. This graph, plotting CO2 levels against wind speed is not from Mauna Loa but from Diekirch, Luxemburg. Notice the wide spread (320-560ppm) in CO2 levels. The red baseline is arbitrarily chosen to represent 'maximal atmospheric mixing'. We would have liked to see such a graph from Mauna Loa  and also the original raw (unfiltered and uncorrected) data. See notes  and  below. Apparently there are now some 100 CO2 monitoring stations world-wide. Note the large amount of uncertainty and thus scope for arbitrary 'adjustments' and fraud, because it is politically unthinkable that the Keeling Curve one day may dip downward steeply. Since 2008 the Keeling curve has been flattening and may begin to dip soon as a result of cooling oceans. Who knows. See also climate chapter4. Note re Mauna Loa and Baring Point: these two places also 'cherry-pick' their results from natural variations in their measurements. At Mauna Loa the low points are selected in order to avoid measuring CO2 from nearby volcanoes. Thus the wind direction is important in their measurements, as it is also at Baring Point. Both sites measure the CO2 concentration above the ocean, thus are not representative of CO2 over land, or 'world average' CO2. Ferdinand Engelbeen (Belgium) has a very good page with data and graphs, studying whether the increase of CO2 is from human sources and also the raw data of Mauna Loa, and much more: http://www.ferdinand-engelbeen.be/klimaat/co2_measurements.html We agree, the human signature is found wherever CO2 is found or used, but there is no hard proof that the rising level of CO2 in air is caused by humans and that this causes a rise in temperature. The noise on the Mauna Loa signal is about 4 ppm CO2. The noise in the picture above is over 200ppm, so we are skeptical about the ML noise of only 4ppm. www.ferdinand-engelbeen.be/klimaat/jaworowski.html Ferdinand Engelbeen rebuts Jaworoski's criticism. The science is not settled. www.21stcenturysciencetech.com/2006_articles/IceCoreSprg97.pdf Zbigniew Jaworowski (1997): Ice Core Data Show No Carbon Dioxide Increase. Jaworowski explains in detail what is going on in ice as it ages under pressure in ice sheets. Where is the CO2 in the oceans? There is a difference between CO2 from burning wood and that from fossil fuels in the amount of radioactive carbon. Weak cosmic rays are capable of changing a normal nitrogen atom into radioactive carbon. So a very small percentage of the air we breathe is radioactive. When plants incorporate this CO2 into their woody tissues, it is locked in place while its radioactivity slowly decays to zero. On the basis of this, scientists are able to measure the date of anything that has been made by life. However, in the course of millions of years, the remaining radioactivity can no longer be determined, as in fossil coal and oil. CO2 from burning coal is thus entirely non-radioactive. the amount of non-radioactive CO2 is large, and that of the radioactive part is small. only a very small amount of non-radioactive CO2 originated from fossil fuel. one cannot tell from the reduced radioactivity whether this was caused by age or by dispersion into the rest of the ocean which is also rather old, or by the amount of human-made CO2. In the diagrams above, the result is shown of how much CO2 in the ocean is likely to have occurred from fossil fuel. Apart from a mixing area in the South Atlantic, the ocean remains essentially layered to some 1000m (because of thermoclines). The red band corresponds to 60-70µmol/kg of fossil CO2 compared to a total of 2050µmol/kg, or about 3%. So the whole effect of the industrial age boils down to an increase of 3% fossil CO2 in the surface of the ocean. Note that this does not mean that the sea is sequestering CO2 from the atmosphere. It just means that in the exchange between ocean and atmosphere, fossil CO2 takes part, as expected. The question now remains whether this CO2 caused the oceans to become more acidic. But first we need to know how acidic the oceans normally are. How much CO2 is absorbed by the oceans? We have rough estimates of how much carbon dioxide is recycled by the oceans (40-100GtC/y), but no hard data as to how much is permanently absorbed by it. The whole question about whether CO2 causes global warming or global warming causing CO2 has not been solved either. With nearly 40,000 GtC in the oceans, of which about half would escape for 10 degrees warming, means that a very small warming of 0.1 degree would still release 200 GtC to the air, or 25 years of human consumption. Global warming protagonists insist that more warming has happened than that, since the industrial revolution. From sediment cores, scientists were able to obtain a record of past carbon dioxide levels, and these were very high for about 200 million years, with some 50 million years of low levels, and earlier still, very high indeed. So where did all that carbon come from and where did it go to? From the blue line one can see clearly two sequestration periods, one in the Carbon/Devonian 350-400 million years ago, and this was when coal was laid down in the freshwater marshes (a vast quantity). During the dip at the end of the Cretacious (K), all oil was laid down in the middle seas while Gondwana was breaking up. Presumably all this CO2 came from volcanic activity. It is important to remember that in order for the oceans to permanently fix more CO2 (which is true also for plants on land), the level of CO2 in the air needs to be higher than it was before the industrial revolution (the hockey stick for global temperatures). Sequestration at previous CO2 levels is not possible. It is widely claimed that the oceans absorb (sequester) up to 30% of anthropogenic (man-made) CO2, but this cannot be measured. 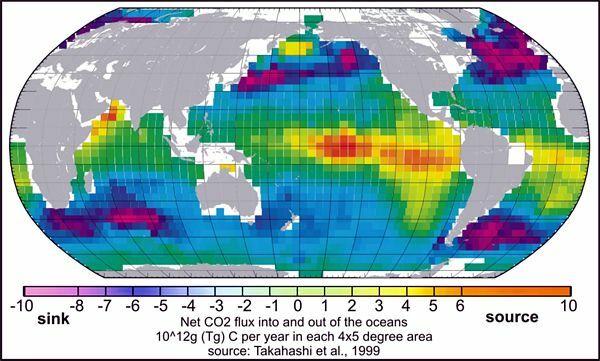 The Joint Global Ocean Flux (JGOFS) survey has substaniated that the oceans absorb CO2 in cold seas while expelling it in warm seas, as shown in the above map. Although much of it (if not all) can be attributed to the fact that CO2 dissolves better in cold water, which can also contain more of it, there is also the biological pump. The sea is an ecosystem in which phytoplankton absorb CO2 as the beginning of the food chain which ends in top predators. When they die, they sink to the bottom, thus continually pumping CO2 towards the bottom of the oceans. In ocean upwellings, some of this CO2 reappears at the surface. There are two areas of high productivity: the southern oceans and the equator, but the one is a source, as the other is a sink for CO2. So the ocean pump draws CO2 down in cold seas while expelling it in warm seas. Reader please note that it cannot be ascertained whether the oceans as a whole absorb or emit CO2. 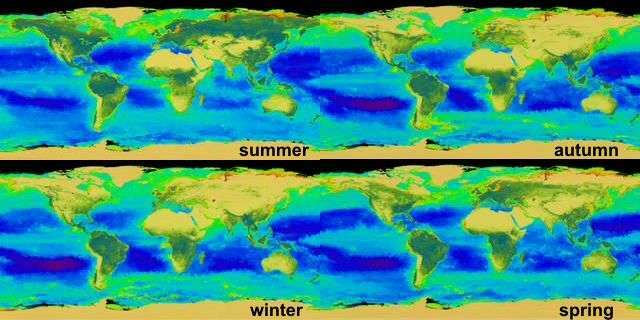 Satellite scans from NASA show seasonal changes in the chlorophyll greenness of land and sea. In the northern summer the ice and snow covering the boreal conifer forests has melted, and the deciduous trees of temperate climates have sprung into leaf. It is a massive change from winter. By comparison, the southern hemisphere in its summer, does not have much change to show for, mainly due to the fact that there is little temperate and boreal land, but the Southern Ocean does spring into bloom. From just over one decade of observations, it was calculated that Earth's greening increased about 6% or about 0.5% per year, mainly at the fringes of forests. These maps cannot show that forests also become denser. However, 0.5% of 70Gt living plant matter = 0.35Gt, compared to 8Gt human emissions. Note that sequestration by plants can occur only in places with enough moisture and nutrients. To understand ancient epochs, read our Geologic Timetable. 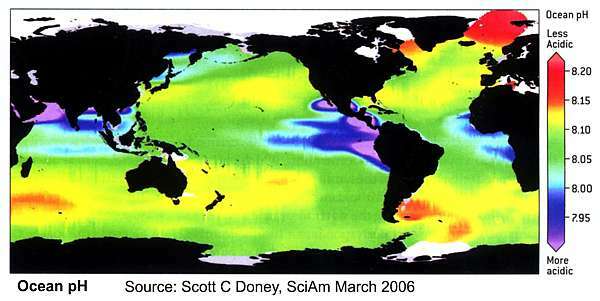 As this map suggests, ocean pH measurements have been done all over the world and in the most unlikely places. The false colour scale on the right suggests a range from 7.9 to 8.2 (personally I have measured a wider range from 7.8 to 8.3). 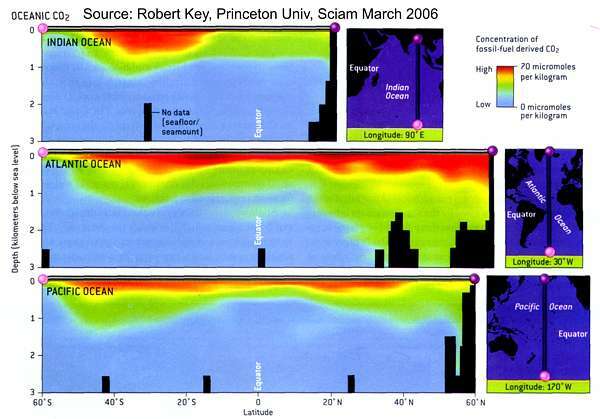 The lowest pH occurs in upwelling areas whereas highest pH occurs in the centres of ocean gyres. From this extensive mix it would be difficult to state what the 'average' pH is for the oceans, let alone whether the oceans have become more or less acidic. Note that upwelling areas are more acidic because high-CO2 bottom water surfaces, warms up and makes CO2 more readily available, a bonus for photosynthesis by marine plankton. My own measurements (see DDA) showed that the resulting pH is a tug-of-war between photosynthesisers that scavenge hydrogen ions to such extent that some lakes in summer and rock pools can go as high as 9.0, against decomposers that decompose living and nonliving biomatter to unlikely levels of 5.0 in putrid mud. pH is relatively low in eutrophied (overnourished) seas that can only be called sick. This implies that the degrading state of our coastal seas must have been accompanied by a decrease in pH ('acidification'). However, none of the scientific papers I read even mentioned this.Also, in order to measure the 'natural' pH in a sample, onne must first kill all living organisms (phytoplankton and bacteria). however, this is never done. Where does the scare story come from? These 'scientists' use a computer model for the uptake of CO2 from air, assuming that consumption and emissions will increase exponentially from zero in 1850. The resulting pH curve is then shifted up/down to co-incide with today's assumed value of 8.05, suggesting an initial pH of 8.15 (that was never measured experimentally) and thus 'already' a drop in pH of 0.1 since 'before the industrial revolution' (pink rectangle). [sigh] Another misleading and untested computer simulation. Researchers  used the radioactive Boron-11 isotope in fossil corals to reconstruct a Holocene history of sea surface pH variations for the South China Sea. It showed that alkalinity varied between a pH of 7.91 and 8.29 during the past seven thousand years. Such variability far overshadows the fear of 0.3 pH change in two centuries. It must be noted, however, that most of the variation was towards 'healthier' values above 8.2. Liu, Y et al. 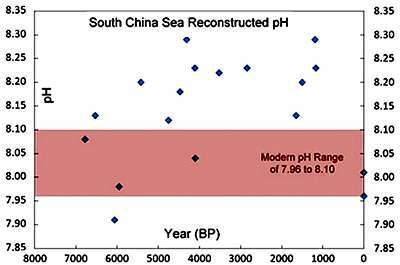 (2011): Reconstructing seawater pH in the South China Sea. Geochimica et Cosmochimica Acta 73: 1264-1272. Are oceans becoming more acidic? Measurements done during two NOAA voyages in the Pacific, about a decade apart, are the cause of the whole ruckus about ocean acidification. From these two voyages (one experiment) it is claimed that the average alkalinity of the ocean decreased by just 0.025 pH units amounting to an increase in DIC (CO2) of 15µmol/kg (0.73% of a total of 2050µmol/kg). I have not been able to ascertain whether adequate precautions have been followed, because measuring an absolute difference of 0.1pH borders on the margins of the possible, let alone 0.01. In the decade between the two voyages, also the pH measuring apparatus has changed, and so on. But a pH unit of 0.025 on a rather exponential (logarithmic scale) amounts to antilog(-0.025)=0.944 or 5.6% more hydrogen ions. Note that this is the only accurately measured value. Even so, no precautions were taken to exclude living organisms (phytoplankton and bacteria) from their samples or to sample only at night (when only bacteria are active). For that reason alone, the experiment was fraudulous and ignorant. There exist very few time series of ocean measurements. The longest are HOTS (Hawaii Ocean Time Series, since 1990, but does not measure pH) and BATS (Bermuda Atlantic Time-series Study, since 1984). Shown here is BATS for twenty years, with total dissolved inorganic carbon (DIC, mmol/kg), TA (Total Alkalinity), CO2 concentration (ppmv) and pH. One can see that there is quite a high degree of variability, with total carbon varying by 50mmol/kg (1.4%), CO2 all over the place, varying 100ppmv (25%) and the pH by 0.12 (32% hydrogen ions). With some difficulty a slanting line can be drawn for -0.03 pH (7%H) and +20ppm CO2 (5.9%) in 20 years. In the same period Mauna Loa measured an increase from 345 to 375ppm (8.6%). Before one can say that the decline in pH was caused by carbondioxide, one needs to prove that it was not caused by other acid gases, land-based effluent and eutrophication/degradation were not the cause. This has not been attempted. Note that the time series does not show any cyclic effect from El Niño (temperature variation) or any other cycle and is therefore too short to draw any certain conclusions from. Note that the pH makes large excursions that must have been caused by life. Note also that the pH makes large excursions downward but not upward, as if it reaches a maximum. This agrees with our observations that a high pH is limiting plankton growth: as plankton blooms scavenge hydrogen ions (and CO2 which is practically a mirror image), which causes the pH to rise until a dearth of (lack of) hydrogen ions becomes limiting, while there is still plenty of CO2 for photosynthesis (300-320ppm)! It also shows that measuring pH without first disabling all life in the sample, does not make much sense. The Monterey Bay marine aquariums have been monitoring seawater parameters (temperature, pH, salinity, ammonia, nitrite, nitrate, phosphorus) for over a decade, and the graph here shows average monthly pH from 1995 to 2009. Because of the depth of the intake, near the thermocline, most parameters fluctuate wildly between surface and deep water quality. In a single day the temperature may vary regularly by 2ºC and sometimes by 4ºC, considering that winter to summer varies by only 2-3ºC. Compare this to the oceanic BATS data above, and it becomes clear that coastal water varies considerably from day to day, season to season and year to year. The important message here is, that when people talk about 'THE average pH' of THE ocean, they do not know what they are talking about. Reader please note that these are the ONLY experimental smoking guns for ocean acidification! Those familiar with science know that a single experiment cannot be hailed as conclusive, as it needs to be replicated by others, and also shown to be true over a representative extent of ocean. But the situation becomes worse, if one knows that an increase in hydrogen ions of pH=-0.1 also makes the sea 20% more productive, leading to 20% more biomass if nutrients were sufficiently available. Such is the case in all coastal seas above continental shelves and far beyond, due to rampant soil erosion. In 2003 a paper appeared by Caldeira & Wickett which is based on computer simulations. They claim that already the oceans have acidified by 0.1 pH units. No actual measurements to back this up, and no mention of the calcium ion and carbonate buffering of sediments and no mention of eutrophication either. The 0.1pH amounts to 21% more hydrogen ions. This paper is interested in the possibility of injecting CO2 into the deep sea, a technological 'solution' to reduce emissions. In 2005 a paper by Jacobson appeared, who calculated pH from dissociation constants, assuming that the ocean is in equilibrium with the air. In his paper he includes dissociation constants of over 50 possible ion species in seawater, a truly complex system with enough scope for error. He claims that in 1751 ocean pH was 8.25 and now 8.14, a difference of 0.11 pH units or 22% more hydrogen ions. We wonder why the measurements in 1751 were so accurate and reliable. He goes further by claiming that when CO2 reaches 750ppm, the ocean will eventually settle at a pH=7.88, or a drop of 0.37 or an increase in hydrogen ions('acidity') of nearly 60%. Did he verify this with tests? No. The interacting chemistry of seawater is just too complicated to fully understand and even the carbonate part of it is not fully understood. Although time series are still too short, other stations report increases of 0.4 to 2.2 µmol/y, equating to a decrease in pH of around 0.0012 per year. Note that because pH is a logarithmic scale, this annual decrease cannot be extended far into the future by multiplying it with the number of years. Much ado is being made of the Bjerrum Plot, named after N Bjerrum (1914) who invented the diagram for visually representing the equilibrium between the three carbonate species CO2, HCO3 and CO3. With very precise equations, corrected for temperature, this system is well defined for the ideal situation (distilled water). What the plot says, is that for instance at a pH of 8.1 for the ocean, the three carbonate species are given by the intersection of the dashed vertical with each of the curves, giving 0.02, 2.05 and 0.12 mmol/kg for each (note that the drawing above is not accurate). By making the sample more acidic, hydrogen ions out-compete the hydroxyl ions (cyan), which results in more CO2 in solution (red), less CO3 (green) and an inconsequential change in HCO3(magenta) (the FAT arrows). No problems here, but scientists now claim that an increase in CO2 is the same, and this cannot be true as an increase in CO2 simply lifts all three curves a little higher (Le Chatelier's principle). Le Chatelier's Principle: Adding CO2 to a CO2/carbonate equilibrium (including carbonate rock) will drive the reaction towards the formation of MORE carbonates, not less. the plot doesn't explain the difference in pH between rain water, lakes and seas. Neither does it explain the wide range in the pH of lakes. the plot does not take account of other mineral ions, of which calcium is the most important. These ions compete for hydrogen or hydroxyl ions and even for ions of the carbonate system. the plot does not include stabilising carbonate deposits. the plot has never been proved experimentally for the complex sea water system. what the Bjerrum plot DOES show is that if the sea becomes acidic for other reasons than CO2 (acid rain, runoff, eutrophication, warming, artificial addition of acids), CO2 levels WILL increase even if atmospheric CO2 does not increase. 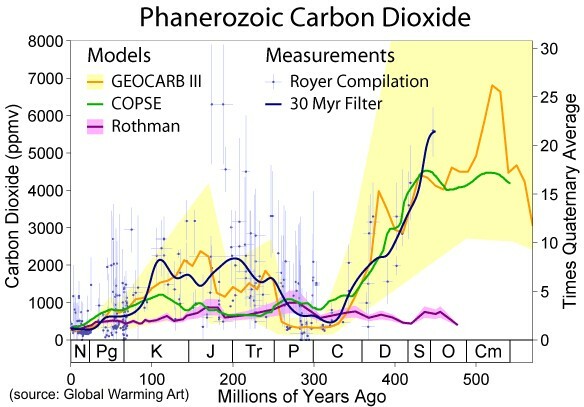 Rather than computer simulations we like to see an experimental plot with the amount of CO2 horizontally, and vertically the three carbonate species and pH. Failing this, the Bjerrum plot is merely interesting item and of little consequence to the issue of ocean acidification. Below is a more exact graphical representation of the relationships between CO2, CO3 ion and pH, according to the Bjerrum plot. It shows the effect of adding an acid (HCl) to lower the pH or a lye (NaOH) to raise pH, but it is not representative of the natural situation in the real world. Note also that the graph disagrees with the concentrations quoted in the Bjerrum plot above, as it also disagrees with how CO2 dissolves in water (above). they add hydrochloric acid (HCl, because salt water has a lot of chloride ions already). This shifts the pH baseline in the Bjerrum plot above to the right, producing more CO2 in a more acidic environment. It is a scientific fraud because it also produces less of the CO3 ion instead of more, resulting in abnormal dissolution of shell. they bubble CO2 through the water, thereby essentially increasing the left-hand side of the equilibrium equation. Although this reflects the real-world more than trickling acids through the water, it is still a scientific fraud because the water is not given time to form more of the CO3 ion from carbonate deposits. ".. coral calcification responds to [the concentration of the CO3 ion] rather than pH or some other component of the surrounding seawater environment" (Langdon 2002, Schneider & Erez 2006) ".. lending support to the hypothesis that it is the product of [Ca ion concentration] and [CO3 ion concentration] but since Ca is not limiting, calcification is mainly dependent on the [CO3 ion concentration]" - in Kleypas et al (2006). Reader, this essentially supports the above. Some publications insist that during the formation of limestone (calcification), CO2 is produced rather than absorbed, as if saying that the coral reefs that consist almost completely of CaCO3, do not contain CO2, and that they were built by releasing CO2. As if trees by forming wood, release CO2 rather than sequester it. So what is the story? We know that trees sequester (absorb) CO2 to make woody tissues, and when these decay, the CO2 is returned to the air. But when the trees fall in marshes, decompositon stops and the CO2 remains captured, eventually turning into coal and gas. Is the same not happening on coral reefs? The story here is considerably more complicated and uncertain. According to the equilibrium equation and the graph above, one can see that taking 50 µmol CO3 out (green), about 8 µmol of CO2 (orange) will escape from solution (1/6). Some scientists insist that even more will escape (Zondervan et al. 2001) because it takes two molecules of CO2 to produce one CO3 ion. It may be worse still because of the 1:100:6 ratios where one CO3 ion may shift 100/6 ions of HCO3 towards CO2. The problem here is the calcium ion Ca2+ of which some is in equilibrium with the CO32- ion and this in turn is in equilibrium with sediments, largely made up of limestone CaCO3. When one studies salt water in a laboratory beaker, it is true that calcification leads to the release of CO2. Likewise in a marine aquarium, a seashell can make new shell only when somewhere else a shell dissolves. Thus the path to the coral reef comes from sediments: CaCO3 in sediment => Ca2+ + CO32- in sea water => CaCO3 in coral without either release of CO2 or sequestration of it from air. Obviously, there is a lot of uncertainty here. There have been alarming claims that the phytoplankton in the oceans has declined by 40-60% during the period of global warming, pointing at either temperature or CO2 to blame. Since phytoplankton forms the food at the bottom of the food chain, it follows that all other marine organisms, including fish are threatened. This image from NASA Earth Observatory shows how diatoms, the most nutricious "grass" of the oceans, declined (green graph) against projected rising CO2 concentrations (blue graph, not actual). One can immediately see that it is fake because the green graph is actual data from supposedly 1850 to present whereas the blue graph extends to unrealistic concentrations of 1100ppmv in a fantasy future (present is around 400). So let's look at actual observations from seafarers, collated and normalised by Boyce et al (2011). This was a mammoth task because observations were dissimilar (colour estimates, Secchi Disk measurements, chemical analyses, satellite observations) while covering mainly ships' sea lanes, mostly in the north. The dataset was then split over ocean areas ranging from the Arctic to the Antarctic, here overlaid in a single graph. Indeed a general decline is apparent from a peak around 1950. Most importantly,the Arctic has highest productivity and the equatorial Pacific least., suggesting a temperature effect. However, remember that the warm tropics have a pronounced thermocline which prevents nutrient-rich cool deep water from surfacing. Note also that the data is skewed towards the northern summer. For good measure the ships-observations of sea surface temperature (SST) as reconstructed from the Comprehensive Ocean Atmosphere Data Set (COADS) is shown here in magenta. A correlation is not evident. Reader please note that our existing knowledge of plankton ecosystems is ruefully inadequate and may even be wrong. So why is acidification considered a problem? This brings us to some questionable science that was looking for an excuse (Victoria Fabry in James C Orr et al. 2005). 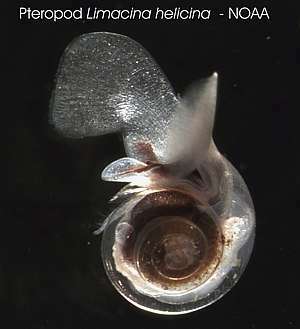 By examining certain shell forming plankton species like pteropods (wing-foots, pelagic snails that swim with their foot), it was found that some had minor damage to their shells. Apart from being inconclusive, these results were then hailed as proof that higher acidity in the sea would dissolve shells faster and that eventually the snails would not be able to make their shells fast enough, and that this would lead to extensive ecosystem changes and extinction of species. Also coral reefs would dissolve and weaken and combined with global warming, disappear from the face of the ocean. Oops. (note the one way reaction => because water is transported away) So it is thought that more CO2 in ocean water would do the same. Apart from the fact that a pH=6 has 100 times more hydrogen ions than a pH=8, and does not seem to worry freshwater snails in lakes, sea water is almost saturated with calcium (Ca). Remember the CO2 equilibrium equations that end in carbonate CO32- of 0.12 mmol/kg compared to that of Ca2+ of 10.4 mmol/kg? This means that there is not enough carbonate in the water to combine with the free calcium, and any increase in CO2 would mean that laying down a limestone skeleton becomes easier rather than more difficult. An increase in carbonate leads to calcification of CaCO3, just the opposite of what is being claimed! In other words, the vast store of calcium in the oceans has a buffering effect. Notice in this respect also the way salts precipitate when making table salt from sea water (/oceano/seawater.htm), with CaCO3 the first to settle out, followed by gypsum CaSO4. Sarma et al. (1971) reported an increase in alkalinity of about 11 µmol/kg when DIC (CO2 species as Dissolved Inorganic Carbon) increased by about 20µmol/kg, which should create some inconvenient doubt. On the surface of the ocean all dissolved gases are in balance with those in air. But in the water, with the help of sunlight, plants produce oxygen while consuming CO2. So oxygen concentrations are higher and carbon dioxide concentrations lower than in air. As one goes deeper, the beneficial effect of photosynthesis decreases, and CO2 increases due to breathing and decomposition. In theory at least, the water becomes more acidic with depth, to the point that the thin skeletons of plankton critters (coccolithophores, pteropods, foraminifers, etc) could begin to dissolve. This is called the aragonite saturation horizon (0.5-2.5km). Below it, the shells dissolve, whereas above it, they supposedly don't. As we have shown above, this is a dubious concept (Sarma et al, 1971). There is likewise also a calcite saturation horizon (1.5-5km). The concept 'explains' why clay deposits without limestone occur deeper than those with limestone as carbonate ooze. The diagram shows actually measured values for the carbonate ion CO32- versus depth (red line). Below 2km the concentration is rather static although it decreases further with pressure. Where it crosses the (hypothetical) aragonite saturation horizon, sea shells will be dissolved gradually, and below where it crosses the calcite horizon, calcite will dissolve as well. It is thought that increased CO2, and thus acidity is the cause of this. Sadly actual pH is missing from this graph (why was it not measured or published?). These hypothetical horizons are very dependent on temperature and pressure: the higher the pressure, the more readily calcite dissolves. Lower temperatures also increase the solubility of the water, and temperature decreases with depth. Hence it is not clear whether acidity or pressure or temperature are the main drivers. For this reasons the cold oceans like the Southern ocean are most likely to become under-saturated, one of the main scares. What must also be remembered that the act of dissolving CaCO3 (limestone) into seawater also increases the pH. Thus the huge amount of ocean sediment will neutralise any acidification. It is estimated that ocean sediments amount to 30,000,000Gt carbon, a massive reservoir. But since most of it is in the deepest parts of the oceans, it may take a millennium to become effective. The Royal Society UK (2005) report gives a good example of reasoning gone wrong: "Marine organisms that construct CaCO3 structures, such as shells, are dependent on the presence of bicarbonate and carbonate forms of dissolved inorganic carbon. Once formed, CaCO3 will dissolve back into the water unless the surrounding seawater contains sufficiently high concentrations of carbonate ions (CO32-). . . .The formation of CaCO3 leads to an increased CO2 concentration in the water. This apparently counterintuitive behaviour arises because two ions of bicarbonate (HCO3-) react with one ion of doubly charged (Ca2+) to form one molecule of CaCO3, which leads to the release of one molecule of CO2. . . . Under current conditions, for each molecule of CO2 produced during calcification, about 0.6 molecules are released . . . A decrease in calcification resulting from increased acidity would . . decrease the total emission [of CO2] from the oceans . . (Zondervan et al. 2001)"
"To make these calcareous structures, seawater has to be supersaturated with calcium and carbonate ions to ensure that once formed, the CaCO3 does not dissolve." "For example if the deep oceans start to become more acidic, some carbonate will be dissolved from sediments. This process tends to buffer the chemistry of the seawater so that pH changes are lessened." The report adds: "Essentially this is an area of great uncertainty. This example is provided, in part to highlight the complexity of the interactions between the chemical and biological processes in the oceans." Reader, figure it out: The more carbon dioxide is absorbed by the oceans, the more it produces ??? The three equilibrium equations: an increase in CO2 on left decreases CO3 on right??? Water needs to be saturated with CaCO3 in order to make shells? An organism's internal chemistry and buffering plays no role? What's wrong with experimenting? 0708135: a smooth tiger shell (Maurea tigris) has almost completely dissolved back into seawater, showing its spire made from more dissolution-resistant nacre (mother-of-pearl). It took just over a year from live animal to this stage. 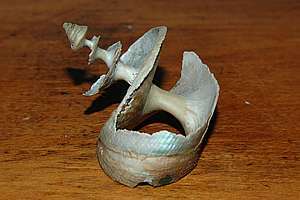 f012810: after about 6 months the fragile shell of a paper nautilus becomes too brittle to handle. In 12 months it has dissolved completely in clear seawater. Aluminium cans dissolve in 5-10 years! How much carbonate in sediments interacts with the sea water? I haven't found a useful figure for this, apart from 30 million Gt in marine sediments. But what we know is that the surface of the ocean is about 360 million km2 (360E12 m2). Thus the sea bottom is similar in size. If only 20cm of the sea soil is perturbed (dug over) by benthic organisms, this would amount to 0.2m3 per m2. If only one fifth of this is limestone, then a cautious estimate would yield 0.01 tC/m2 and the whole active ocean floor 3.6E12 tC or about 4000 GtC. The coastal regions, estimated at 10% of the ocean surface, would have at least 400 GtC in active contact with the sea water. In all, this is a formidable factor to consider, particularly for the CO3 ion. Is CO2 a potent fertiliser? For plants to grow, they need to assemble C, H and O approximately in the ratio CH2O. For this they need water and CO2 and an external energy. Nutrients are required in much smaller amounts. A sufficient temperature is also required. What many people don't realise is that there is only one pool of CO2 (in air) for which all plants on land and in the sea compete, to the extent that they draw it down until it becomes a major limiting factor for all. It stands to reason then, that CO2 'fertilisation' enhances plant growth, and indeed this is very much the case on land, provided enough water, nutrients and warmth are also available. That is why natural carbon sequestration happens in certain areas on the planet and not in others. But in the sea, the situation is different because there is already such an abundant source of carbon dioxide. Here the availability of nutrients is the most important factor. Researchers find less than 10% growth for a 100% increase in CO2, but benthic algae (seaweeds) may become much more productive (Kuebler et al., 1999). Reader please note that our discovery of slush and symbiotic decomposition, means that algal cells have a different way of obtaining nutrients and CO2, particularly in blue seas with little phytoplankton and nutrients. Our own discoveries (DDA) show that the sea does not at all work as expected, and that marine plants (and corals) depend more or less on symbiotic decomposition. We have shown that a lowering of the pH is beneficial to overall productivity and biomass. As far as measuring the effect of raised CO2 levels on marine animals, the situation is complicated because CO2 rapidly becomes toxic, with symptoms of depression of physiological functions, depressed metabolic rate + activity + growth, followed by a collapse in circulation. Remember that free CO2 amounts to only 1% of the total CO2 'bonded' to the water and that it takes some time for equilibrium with the other CO2 species to happen. It is thus too easy to overdose the free CO2 by increasing the CO2 in the air above. In other words, it is nearly impossible to mimic the natural situation truthfully in an experiment. Nearly all alarmist publications and organisations claim that global warming is bad for corals, to such extent that they may be extinct by 2050. So how could coral reefs be threatened? coral bleaching: coral bleaching by which a coral loses its symbiotic algae, may cause death. It is loosely linked to exceptional warm water. In case the Earth warms further, there is a chance that corals may not survive. But in most reported cases I investigated, the quality of the seawater was visibly poor, indicating stress from water degradation..
rising seas: seas may rise so fast due to the expansion of the water column and due to the melting of ice caps, that corals may not keep up. They will end up in deeper, darker water, which could mean death or at least a major ecological turmoil. However, corals thrive in shallow water. ocean acidification: corals make their limestone skeletons from the calcium and carbonate ions in the water. If higher CO2 levels in the atmosphere cause the sea to become more acidic, they may no longer be able to do so, while also their (dead) skeletons dissolve faster back into the sea. Reefs may become a thing of the past. coral bleaching: scientists discovered that corals are not picky about the type of symbiotic alg (a dinoflagellate) they host, and are capable of adopting temperature-hardier variants of symbiodinium in a process named symbiont-shuffling. In fact, corals may have some hardier variants already as part of their customary algal lodgers. Once a coral recovers from bleaching, it proves to be hardier and not as easily bleached. So coral reefs adapt in a matter of months to years. Corals also respond favourably to warmer water by also growing faster (3-5% for one degree Celsius). rising seas: many reefs are already limited in their growth by falling dry during spring low tides. Also fresh water floating on the surface, limits their growth. Fossil cores have shown that reefs have kept up with rising and falling seas during the ice ages and long before that. Most corals grow much faster than the worst-case predicted rise in sea level. ocean acidification: because corals are encapsulated by live tissue within which the concentrations of minerals are controlled by the coral polyp, they are not very sensitive to acids outside. However, since their metabolism depends on that of their algal symbionts (who provide the food), they react favourably to raised levels of CO2, also producing skeleton faster. Warmth and CO2 work together, resulting in rapid growth, rather than decay. Idso, Craig D (2009): CO2, global warming and coral reefs: prospects for the future. http://scienceandpublicpolicy.org/originals/co2_coral_warming.html free PDF (81 pages). An excellent review of published science confirming that corals adapt well to warmer seas, rising seas and acid oceans. In fact, they love it! Must-read! Idso, Craig D (2010): A new propaganda film by the NRDC fails the acid test of real world data. SPPI Institute. Free PDF (53 pages). In June 2008 an important paper appeared in the scientific journal Nature . Rather than doing tests in the laboratory, these scientists studied how life changes around natural CO2 vents in the sea. The advantage of this method is that one studies a situation that has been in existence for a long time, giving species time to adapt (? see box below) while also revealing long-term effects. The disadvantage is that the situation does not allow for a sufficiently 'controlled' experiment. They chose 'cool' CO2 vents that produce no additional poisons like hydrogen sulfide. The study centred along a small islet/pensinsula along the larger island of Ischia, on Italy's west coast. The study shows that along a daily fluctuating gradient from normal sea water (pH=8.14) to acidic water (pH=6.57), species diversity suddenly drops at around pH=6.8 (about 20 times more acidic). It affects mainly calcareous algae, sea urchins, limpets, grazing snails and barnacles. What these have in common is that they produce limestone houses. They also found that normal green algae suddenly increase once the others have gone (their grazers). The conclusion at the end of the article: "This opportunity to observe the tipping points at which principal groups of marine organisms are affected by lowered pH proves that, even without global warming, the projected rise in atmospheric CO2 concentration is hazardous, as ocean acidification will probably bring about reductions in biodiversity and radically alter ecosystems." In the BBC report (http://news.bbc.co.uk/2/hi/science/nature/7437862.stm), the following quote appears: "I can't count the number of times that scientific talks end with 'responses have not yet been documented in the field'," said Elliott Norse, president of the Marine Conservation Biology Institute (MCBI), "This paper puts that to rest for several ecologically important marine groups." "The reason that the oceans are becoming more acidic is because of the CO2 emissions that we are producing from burning fossil fuels," observed Dr Turley, "Add CO2 to seawater and you get carbonic acid; it's simple chemistry, and therefore certain. This means that the only way of reducing the future impact of ocean acidification is the urgent, substantial reduction in CO2 emissions." - Oops, what is so simple and certain about ocean chemistry? However, we have some reservations about this work, since science is not only about measuring a correlation between supposed effect and cause, but also about proving that the correlation is not caused by anything else, which is what these scientists omitted. The CO2 vents were found towards the main coast and the coastal gradient extended outward from this coast (co-inciding with an increase in pH). Along such a gradient one also finds a change in water clarity, sediment deposition, shelter from waves (exposure), and human influences like sewage and run-off. It was telling that the measurements done at the northern side of the islet were not reported. Loss of biodiversity accompanied with a loss of coralline algae, urchins, limpets and others, can also be observed anywhere in the world in a gradient from an estuary to an outlying promontory, which is essentially the situation at the location of study. However, the fact that most changes happened within 25 metres, suggests that they were indeed caused by CO2. More important, down to a pH of 7.6 (4x more acidic), no measurable effect was found and minor loss of biodiversity. Thus a doubling (pH=7.9) or quadrupling (pH=7.6) of CO2 concentrations in the atmosphere is not going to have any measurable effect on marine life. This was not mentioned in the article. In fact, the conclusion above is somewhat at odds with it. Our main criticism with the study concerns the fact that water with a pH of 6.0 contains over 100 times the natural amount of CO2, and this is poisonous enough to kill almost all water-breathing organisms. The fact that animals went from perfectly healthy to completely dead within 25 metres, means that the study can in no way be assumed to have any relationship to the real-world situation. Researchers claimed to have calculated 'tipping points' for various organisms, but in this case one cannot meaningfully calculate 'average' CO2 concentrations. To understand this, study the results in the box below. The graph shows the essence of the study. From left to right the transect distance along the rocky shore, moving landward towards the field of CO2 bubblers on right. In this field the pH varies considerably between 6.0 and 7.5 (30-fold). Note that the gas was nearly pure CO2, capable of acidifying the water locally 1000-fold to a pH of 5. However, mixing through turbulence, currents and waves soon dilutes the acid, even though an area of over 50m remains consistently highly acidic. Within a distance of a mere 25m, average acidity changes from 6.5 to 7.7, accompanied by a critical change in the environment, affecting in particular grazing sea urchins, snails and limpets. In their absence while fed by higher CO2 levels, non-calcareous (edible) algae multiply. The early decline of calcareous algae may not be entirely due to CO2 but also to competition with the edible algae and normal coastal degradation. The problem with this study is that it does not reflect a real-world situation where CO2 levels rise slowly, evenly spread over all oceans. This study looks more like a local CO2 Chernobyl with fatal fall-out wafting unpredictably here and there, such that it becomes meaningless to talk of average pH. Note that humans die at a 50-fold increase in CO2, and the situation here comes pretty close to this, if not far worse. For instance, what is the average between 1 and 100? Is it 50? 10? 90? It depends on what the numbers mean (weighted). If the numbers mean food, then the average lies close to one, because hunger (=no food) kills. If the numbers mean threat, then the average lies close to 100, because threats kill. It is also important to note that nature is affected more by bad times than by good times, because during bad times, one is more likely to die. Thus a killer cloud of pH 6.2 wafting over, can be quite decisive, even though it may happen sporadically, not affecting the average. Particularly affected are the young (recruits) of all species. But the long-lived creatures are disadvantaged more than the short-lived ones. It so happens that many of the long-lived ones live in limestone houses. See also our chapter on the principles of degradation. As far as organisms are capable of learning to avoid a killer cloud by migrating away, closing up, burrowing and so, they are capable of adapting somewhat. But adaptation by natural selection of the fittest is not possible because the vents are not isolated like an island where the offspring are born near their surviving parents. In the sea where everything is connected, and larvae drift vast distances, the young of others are born near the vents whereas the offspring of the survivors is born far away in normal conditions. Survivor genes disappear or are diluted. 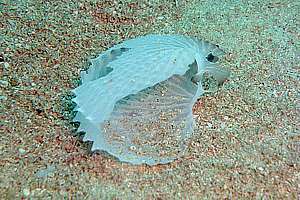 Adaptation(evolution) in the sea differs considerably from that on land. http://www.nature.com/nature/journal/vaop/ncurrent/full/nature07051.html Volcanic carbon dioxide vents show ecosystem effects of ocean acidification by Jason M. Hall-Spencer, Riccardo Rodolfo-Metalpa, Sophie Martin, Emma Ransome1, Maoz Fine, Suzanne M. Turner, Sonia J. Rowley, Dario Tedesco & Maria-Cristina Buia. Unfortunatelly this publication is not free and sets you back by US$32. the deep cores showed an increase in coccolith mass of about 40% in the past 220 years, which roughly agrees with experiments. The curve has a hockey-stick appearance, climbing more steeply in the past 25 years (~25%). This study shows that paradoxically, even though calcite dissolves more rapidly at higher carbondioxide concentrations, it is apparently also more easily made, resulting in heavier shells. A lower pH also encourages productivity, which provides the energy to grow bigger and to make larger shells. Note that this is exactly what we predicted earlier and confirmed in our own measurements (see DDA). The deep sea cores furthermore show that coccoliths provide a substantial sink for CO2, while adjusting to high-CO2 conditions by increasing this sink. Please note that studies like this and others need to be replicated and confirmed, and also note that the carbon chemistry of the oceans interacts with stabilising sediments (buffer). Also note that sea temperature plays an important role. Note also that even though the pH outside organisms changes, this does not imply that it also changes INSIDE them. Important to remember is that this study is about minute plants that benefit from raised CO2 levels. For water-breathing animals, the situation may be different. The graph shown here illustrates how coccolith mass was derived from deep sea core RAPID 21-12-B, dating back to before 1800. Also shown is the IPCC curve for CO2 concentrations in the atmosphere. The past 25 years of coccolith growth suggests that it follows the rapid increase in CO2 concentration in air. For a 20% increase in CO2, size increased about 30%. In laboratory experiments, however, coccolith size and calcification increased mainly betwen 400 and 600 ppm CO2, which has not happened in the sea yet. Could temperature be a driving factor? When CO2 enters the ocean by gas exchange between water and the overlying air most of it is rapidly converted to carbonic acid (H2CO3 ) which then forms bicarbonate (HCO3) and carbonate (CO32-) ions. These reactions release hydrogen ions (H+), making the water relatively more acidic. When coccolithophores make plates of calcium carbonate they also release carbon dioxide. (Coccolithophores are a group of tiny marine plants which include Emiliania huxleyi, they are extremely widespread.) But because these organisms photosynthesize they also consume CO2. It is the balance between calcification - which produces carbon dioxide - and the consumption of CO2 by photosynthesis that will determine whether coccolithophores act as a "sink" (absorbing CO2) or as a source of CO2 to the atmosphere. These results, based on experiments that directly replicate how the oceans take up carbon dioxide, show that the rise in CO2 produced by increased calcification is mitigated by its removal through increased photosynthesis, with a net effect that is unlikely to either contribute greatly or significantly reduce the rise in atmospheric CO2. Co-lead author, PhD student Paul Halloran based at the Department of Earth Sciences, University of Oxford said:'Our research has also revealed that, over the past 220 years, coccolithophores have increased the mass of calcium carbonate they each produce by around 40 per cent. These results are in agreement with previous observations that coccolithophores are abundant through past periods of ocean acidification such as 55 million years ago - the Paleocene Eocene Thermal Maximum." Owing to anthropogenic emissions, atmospheric concentrations of carbon dioxide could almost double between 2006 and 2100 according to business-as-usual carbon dioxide emission scenarios. Because the ocean absorbs carbon dioxide from the atmosphere, increasing atmospheric carbon dioxide concentrations will lead to increasing dissolved inorganic carbon and carbon dioxide in surface ocean waters, and hence acidification and lower carbonate saturation states. 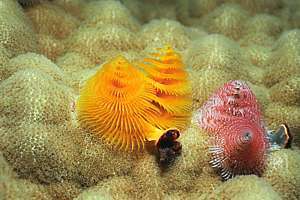 As a consequence, it has been suggested that marine calcifying organisms, for example corals, coralline algae, molluscs and foraminifera, will have difficulties producing their skeletons and shells at current rates, with potentially severe implications for marine ecosystems, including coral reefs. Here we report a seven-week experiment exploring the effects of ocean acidification on crustose coralline algae, a cosmopolitan group of calcifying algae that is ecologically important in most shallow-water habitats Six outdoor mesocosms were continuously supplied with sea water from the adjacent reef and manipulated to simulate conditions of either ambient or elevated seawater carbon dioxide concentrations. The recruitment rate and growth of crustose coralline algae (CCA) were severely inhibited in the elevated carbon dioxide mesocosms. Our findings suggest that ocean acidification due to human activities could cause significant change to benthic community structure in shallow-warm-water carbonate ecosystems. These scientists placed two times three plastic cages (mesocosms) of 1x1x0.5m under water at shallow depth. The advantage of this method is that the study mimics as closely as possible the natural situation, including day-night light rhythm. In one set of three they manipulated acidity to reflect a doubling of CO2 to 800ppm. Then they placed perspex cylinders in each to see what would happen. In the control set they were encrusted by crustose calcareous algae (CCA,'pink paint'), whereas in the CO2-rich set they were encrusted by fleshy green algae. The differences between the two sets were quite dramatic as shown by the photograph and graphic. The conclusion is that man-made CO2 is bad, and that major ecosystem changes can be expected. A final blow to the acid ocean skeptics. End of debate. Period. ... Unless we examine the fine print and do some detective work. Crustose calcareous algae or pink paint as divers call it, is a group of the most astounding organisms on our planet. If you were told about stones that grew and replicated, you would disbelieve. Yet it is true. CCA is living limestone, physically a red seaweed but without any flesh or vessels. It grows in the shallows, exposed to ultraviolet and low tide, yet forming extensive rocky platforms with caves and tunnels in a mere 6000 years. On coral reefs it is the glue between stony corals, forever scraped and nibbled at by urchins and fish, yet surviving and growing. When algae peter out at the deep end of the photic zone, there is still CCA and at twice that depth too. A boulder in a rock pool may be turned by a storm, leaving its CCA cover buried in darkness. Yet turned back upright after two months, the bleached 'dead' CCA soon turns pink again, resuming business as usual. When going from healthy waters to extremely degraded environments, CCA is one of the last to give up. So come-on, why can this sturdy creature not handle a little extra CO2? What is wrong we must ask? We have some serious misgivings about this work for a variety of reasons. Whenever a scientific article begins with 'anthropogenic emissions' and 'IPCC', it raises the hairs on my back because these people show to have a bias. Real science is about curiosity in about how things work; not about 'proving' an idea. The experiment took only seven (!) weeks (a student's summer holiday), immediately after which the results were published - and accepted by the 'prestigious' journal Nature! The experiment was not replicated; the cylinders were not swapped; mature CCA was not investigated and so on. Instead these people focused on replicating their publication: dial any of the authors (Kuffner or Jokiel will do) on Google and see how many references and duplications come up. Other publications were quick to refer to this shoddy work which is on a par with a school science project. For instance, it is equally interesting to see what halving CO2 levels does, because the claim of 250ppm pre-industrial level may be a myth. Why did the scientists not include a set of enclosures for testing this? Note that this is a general criticism of most studies of the effect of raised CO2. The raised level of CO2 was not achieved by adding CO2 to the water but a highly concentrated solution of hydrochloric acid (HCl) that was trickled into the treatment enclosures. This releases CO2 from the HCO3 species as discussed in the Bjerrum Plot above, but this is not like the real world as it also diminishes the shell-building CO3 ion. It also assumes various densities before diluting completely. And even if this happens in the water above the cylinders, it will still influence the plankton and spores and their settlement. The experiment was not about death or slow growth but about settlement. Algae have a two-phase life cycle: the mature plant makes asexual spores that hatch into male and female plants, too small to see, but these reproduce sexually, and their 'seeds' grow into the colonies observed on the perspex cores, after first some time in the plankton. Thus settlement is about the minute or hour that a 'seed' decides to attach or not; a flash in a CCA's life. And that is all this experiment was about. Settlement is an extremely fickle (not constant, uncertain) process. Put your plastic cores out, together with concrete tiles, and you will see different creatures settle on each type. Put them out today and it may be CCA that dominate. Next week could give barnacles. Next month green algae and limpets, and so on. Settlement experiments are almost impossible to replicate. Which means that they also have little relevance. In the bar chart above, you can see some of that unpredictability. 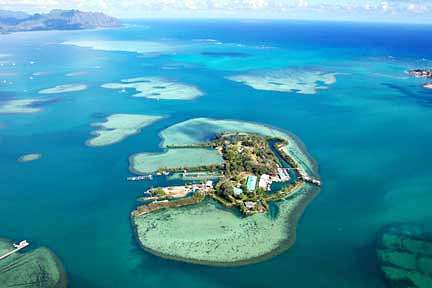 Let me take you to the laboratory where these experiments were done, at Kaneohe, Hawaii (photo below). The water here is not blue as one would expect, but green. It is indicative of degradation from eutrophication. Now look at the pH curves in the graph next to it. The green curve shows the daily pH rhythm for the environment there. For starters, average pH is well below 8.2, a sure sign of degradation. The water here is already 50% more acidic than average ocean water. Now look at how pH changes from mid day to mid night -0.3 units or 2x more acidic, another sure sign of degradation. This is caused mainly by decomposing planktonic bacteria, who never sleep. The bacterial activity follows from the down slope of the curve in darkness, amounting to an RoA (bacterial Rate of Attack) of 20-40 hion (see our DDA method), an indication that the environment here is under significant stress. The point here is that all stresses add up, such that the extra stress caused by high CO2, is only part of the whole and cannot be singled out (see our principles of degradation chapter). Summarising it all: a naive study in a highly stressed already acidic environment, using hydrochloric acid, not replicated and perhaps not reproducible, with the low relevance of a settlement experiment. Their far-reaching conclusions are not warranted by the experiment. Ocean acidification impacts on coral reefs: changes in community structure, Ilsa Kuffner, Andreas Andersson, Paul Jokiel, Ku’ulei Rodgers & Fred Mackenzie http://www.whoi.edu/cms/files/Kuffner_OA_Scripps_34825.pdf [free] a slide show with more information about the work done. Abstract: Reef-building corals are under increasing physiological stress from a changing climate and ocean absorption of increasing atmospheric carbon dioxide. We investigated 328 colonies of massive Porites corals from 69 reefs of the Great Barrier Reef (GBR) in Australia. Their skeletal records show that throughout the GBR, calcification has declined by 14.2% since 1990, predominantly because extension (linear growth) has declined by 13.3%. The data suggest that such a severe and sudden decline in calcification is unprecedented in at least the past 400 years. Calcification increases linearly with increasing large-scale sea surface temperature but responds nonlinearly to annual temperature anomalies. The causes of the decline remain unknown; however, this study suggests that increasing temperature stress and a declining saturation state of seawater aragonite may be diminishing the ability of GBR corals to deposit calcium carbonate. As we mentioned in previous articles, when a scientific article begins with a reference to changing climate and increasing carbon dioxide, the authors show to have an agenda, a belief that is bound to affect their studies. The bottom line reaffirms this belief with increasing temperature stress and declining saturation state of seawater aragonite. Over 30% of this abstract is taken up by assertions that are not borne out by the experiment, reason for extreme caution. We begin our critique with this issue because it is exactly what the international press has latched onto, inferring that this experiment proves corals declining BECAUSE of anthropogenic carbon emissions, whereas nothing could be further from the truth. Google for "de'ath coral" to see the massive damage done by these statements that are irrelevant to the experiment. To take this criticism one step further, these two statements secure the article a place in the 'prestigious' Science journal which over the years has shown itself a firm global warming advocate, together with other 'prestigious' journals such as Nature, Scientific American, New Scientist and a host of others. The two statements are also intended to secure continuation of funding. Reader beware! The species of Porites corals grow slowly outward as a thin peel around previous layers, thus slowly constructing 'massive' (meaning solid) coral bommies. Their polyps are small and they appear smooth, a 'friendly' coral amongs the many sharp and sometimes stinging corals. f044811: a diver in front of a large 'massive' Porites coral in the clear waters of Niue island. The many christmas tree worms are hardly visible on this scale. f044135: christmas tree worms on Porites coral. These beautiful fan worms are only a few centimetres tall, showing how small the Porites coral polyps really are. Porites corals often include other organisms like worms and molluscs in their matrix. 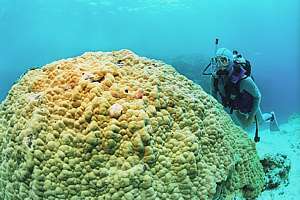 Previous studies have drilled cores into the 'massive' Porites coral which can grow 'coral bommies' of several metres diameter and several hundred years old. These cores from the Coral Core Archive were re-analysed for their calcite (limestone) densities and growth rates, using state-of-the-art scientific techniques of X-ray and gamma densitometry and simple length measurements. Because corals live like plants, their growth rates depend on temperature and the amount of light, both causing yearly bands, much like tree rings. The cores investigated come from all over the north-south extending Great Barrier Reef, allowing investigaters to also study the effect of average temperature. The main finding of the study is shown in this graph for extension (blue, growth rate) (cm/yr) and density (green, g/ml), interpretation of which is confusing. The increasing growth rate since 1900 suggests that the sea has been warming, but it is accompanied by a reduction in density. The product of the two is the calcification rate (red) with a flatter mid-range. Its hockey-stick appearance of dipping down steeply since the late-1990s has been cause for alarm, being clearly 'abnormal' as it has not occurred in 400 years (not shown here). Normal growth of about 1.4cm per year has suddenly dipped to less than 1.3cm/yr, a decline of 14.2% per year, and should this trend continue, the porites coral could disappear by the year 2050. The question is now what caused this sudden decline? Do all Porites corals always end in an extension dip for the past 6-8 years? After all, this is only 6x1.4= 8.4 cm into the coral and it would be foolish to assume that the live polyps end at 1.4cm depth, where they ended last year. In other words, at 8.4cm depth, calcification may still be on-going, extending the coral colony outward as well, and thus 'pulling' the hocky stick for extension up to 'normal' levels as time proceeds. It is logical that where the polyp occupies space, calcification is correspondingly less. Likewise one would not expect much woody tissue in the shoots of a tree, which also extend over time. Ironically, this suggestion has not been considered by the authors. In this context is is important to know whether exceptions have been encountered, corals that do not have a 'stunted growth' towards the present. See also the authors' comment in next paragraph, suggesting that no exceptions were found. Darke&Barnes  found that Porites polyps live on average for 2-3 years with a life expectancy of 5 years. It suggests that some of the hockey stick 'nosedive' is natural. Is it caused by degradation from run-off from the land? This possible cause is rejected out of hand by the authors even though coral reefs are severely threatened by human proximity : "Terrestrial runoff and salinity, although potentially affecting inshore reefs, are also unlikely causes because calcification declines at similar rates on offshore reefs away from flood plumes". However, we (Anthoni) discovered that eutrophication extends far beyond the reach of river plumes and visible runoff, reaching the outer boundaries of continental shelves. Furthermore, when the water is still deemed 'clear' (15m visibility), degradation has its worst effect on sensitive organisms such as found in healthy reefs. To disprove degradation as cause, coral cores must be extracted from areas remote from human settlement. Note also that the authors are still unaware of our recent discoveries about symbiotic decomposition and how corals derive growth in seas devoid of food (nutrients and phytoplankton). Is it caused by warming waters? The graph is contradictory as it confirms that corals do better in warmer water, and also the authors find no evidence along the temperature gradient from north to south along the Great Barrier Reef. Sudden temperature events could do it but these have to be frequent and would not produce a smooth decline as in the graphs. Is it caused by ocean acidification? Unfortunately the coral cores do not reveal ancient alkalinity (pH) and there exists no record of pH measurements over the past 100 years. Besides, acidification is supposed to have been a slow process, whereas the hockey stick suggests a sudden disaster that began less than 10 years ago. Furthermore we have shown that increased acidity benefits productivity in the oceans. No problem, let's then introduce the notion of 'tipping point', a gradual GOOD process suddenly becoming VERY BAD ??? Note that degradation can have a tipping point which is different for each species. The difference between thriving and dying is usually small (the tipping point); a company thrives when it makes a profit but goes bankrupt from small losses. "Laboratory experiments and models have predicted negative impacts of rising atmospheric CO2 on the future of calcifying organisms. Our data show that growth and calcification of massive Porites in the GBR are already declining and are doing so at a rate unprecedented in coral records reaching back 400 years. If Porites calcification is representative of that in other reef-building corals, then maintenance of the calcium carbonate structure that is the foundation of the GBR will be severely compromised. Verification of the causes of this decline should be made a high priority. Additionally, if temperature and carbonate saturation are responsible for the observed changes, then similar changes are likely to be detected in the growth records from other regions and from other calcifying organisms. These organisms are central to the formation and function of ecosystems and food webs, and precipitous changes in the biodiversity and productivity of the world’s oceans may be imminent." These scientists have discovered an interesting phenomenon but have not been honest to the public. They did not disclose doubt and uncertainties, and neither did they disclose any exceptions in the data (any exception may prove the assumptions wrong). They knowingly and deliberately raised the scare for ocean acidification and climate change, whereas their experiment does not support this in any way. Latest update, August 2009. Busted for fraud! Steve McIntyre at Climate Audit (June 2009) gives a chilling explanation of the Porites slow-growth artefact: it is caused by a lack of data, as the dataset suddenly drops from around 40-50 samples to only two! Besides, there is a mathematical averaging problem that does not show in the long-term raw data. The raw data for average calcification shows a steady improvement in coral growth with a sudden drop around the year 2000, not quite resembling the graphs shown in the Science publication. But look at the pink histogram on right, showing the number of datasets used for calculating this 'average'. Since around 1984, this dataset has been declining to about 10, and in 2005 it dropped even further to 2! So all alarm is based on only two items! Could one call this scientific fraud? Surely honest scientists would have mentioned this in their publications? Since this is one of the most quoted papers, using the information of other scientists to invoke an enormous scare, it is necessary for us to subject it to a critical dissection. This paper is similar to that of the British Royal Society, dissected before. Note that the authors believe that the predictions (scaremongering) of the IPCC are correct, and that they base this paper entirely on this assumption. The many experiments cited, done in laboratories and mesocosms all fail to mimic the natural situation, as explained above in scientific fraud. Some of the research quoted has even been debunked by us on this page. In all, this paper sounds like a political manifesto. Reader, as you can see, most of the abstract is scaremongering and is not supported by the uncertainties in the research reviewed. Taking a hand-picked IPCC projection as an unwavering fact, the authors have hand-picked studies that show a decline in calcification for a wide range of organisms, in higher concentrations of CO2 but not in lower concentrations. To give an indication of their assumptions, study the table below which has been taken in its entirety from the paper, in order to avoid making any mistakes. pCO2 in seawater: the IPCC myth of glacial CO2 concentrations of 180ppm, an equally mythical preindustrial concentration of 280ppm to the present 380ppm (the only point with certainty), and from here on extrapolated to twice and three times present concentration. If the first two assumptions are wrong, the others just amplify the error. temperature: from a glacial average global temperature of 15.7ºC (perhaps) through a guessed at preindustrial temperature to the present 19.7ºC and beyond by extrapolation. Notice the disastrous 3ºC global warming! total pH: sinking from an extrapolated 8.32 through the present 8.05 to a future 7.76. These figures follow from pCO2 in seawater (above) and are thus equally shaky. carbonate ion: decreasing as if inside a laboratory test beaker from an extrapolated 279 through the present 182 to an extrapolated future of 115. The effect of the vast amount of buffering not taken into account and Le Chatelier's principle flouted. Shell-building phytoplankton organisms (Emiliana huxleyi, Gephyrocapsa, Calcidiscus) -8% to -66% calcification. Foraminifera (Orbulina, Globigerinoides) -4% to -20% calcification. 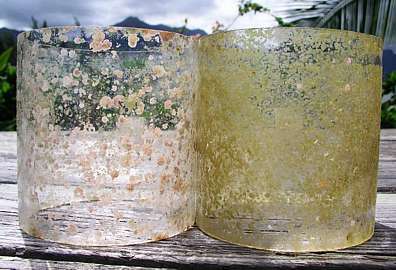 Coralline red algae (Porolithon gardineri) -25% calcification. None of the tested species reacted positively by increasing their calcification rates. Other alarming results were noted for fishes, molluscs and cold water corals. Only sea grasses and fleshy algae thrived. In all a very alarming litany (listing) of bad news. Every scientific account should honestly mention doubts and uncertainties, but this paper mentioned only "but they (scientists) have thus far used abrupt changes in seawater chemistry which do not allow for potential acclimation or adaptation by marine organisms". Yet the whole paper is based on the very shaky predictions by the IPCC, mythical values for the past and extrapolations based on these, a large uncertainty about ocean chemistry, 'fraudulent' tests and selective 'bad news' publications. In other words, the publication was meant to be alarming from the beginning. We wonder when a more balanced account may surface. Marsh, Gerald E : Seawater pH and anthropogenic carbon dioxide. www.gemarsh.com. "In 2005, the Royal Society published a report titled Ocean acidification due to increasing atmospheric carbon dioxide. The report’s principal conclusion—that average ocean pH could decrease by 0.5 units by 2100—is demonstrated here to be consistent with a linear extrapolation of very limited data. It is also shown that current understanding of ocean mixing, and of the relationship between pH and atmospheric carbon dioxide concentration, cannot justify such an extrapolation." There are two conflicting 'knowledges' of ocean chemistry: Pearson&Palmer hold the total of all CO2 species constant whereas Caldeira&Berner hold the CO3 ion constant, resulting in radically different relationships between CO2 concentration and pH. To make matters worse, Le Chatelier principle holds that all CO2 species change, and on top of it all, life has its own influence (growth and decay)And concentrations inside the organism are different from those outside. As further scientific studies appear, the case for a fear of ocean acidification becomes snmaller and smaller. In this chapter we'll summarise those studies debunking ocean acidification as their numbers increase. As we will continue to focus on fraudulent aspects of scientific studies, others have kept an eye on dozens to thousands of studies so far. http://www.co2science.org/data/acidification/acidification.phpOcean Acidification Database containing over 1100 studies. http://www.c3headlines.com/are-oceans-becoming-acidic/summaries of dozens of studies, kept uptodate. Begin here. Dupont, S., Lundve, B. and Thorndyke, M. (2010). Near future ocean acidification increases growth rate of the lecithotrophic larvae and juveniles of the sea star Crossaster papposus. Journal of Experimental Zoology (Molecular and Developmental Evolution) 314B: 382-389. The three researchers report that just the opposite of what is often predicted actually happened, as the echinoderm larvae and juveniles were "positively impacted by ocean acidification." More specifically, they found that "larvae and juveniles raised at low pH grow and develop faster, with no negative effect on survival or skeletogenesis within the time frame of the experiment (38 days)." In fact, they state that the sea stars' growth rates were "two times higher" in the acidified seawater; and they remark that "C. papposus seem to be not only more than simply resistant to ocean acidification, but are also performing better."